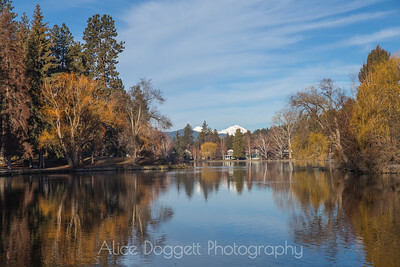 Early morning sun created some nice reflections in a mirror-like surface on Mirror Pond in Bend, with a view of snow-covered Mt. 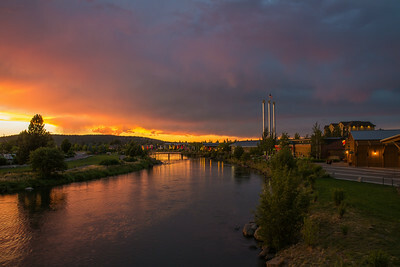 Bachelor in the distance. 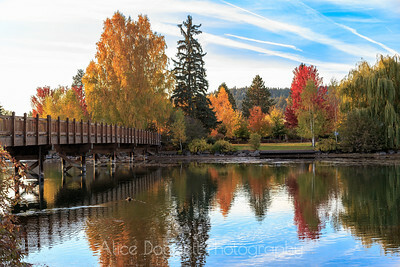 October fall colors from Drake Park overlooking Mirror Pond in downtown Bend. 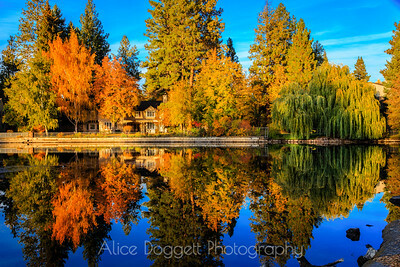 Clouds were coming in from the west, but I was lucky to get out while there was still some sun to light up the colors in the tree leaves. 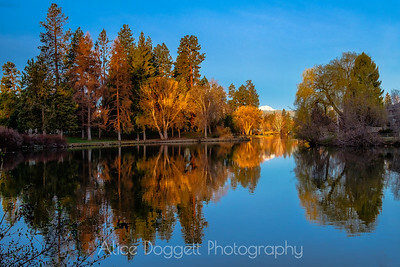 This area around the footbridge is one of my favorite views in Mirror Pond. 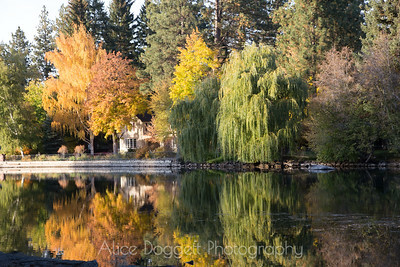 A fall sunset brings out the vibrant colors of the fall foliage around Mirror Pond in Drake Park in downtown Bend. 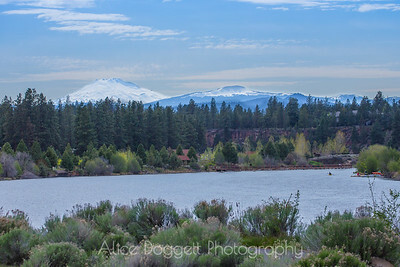 Broken Top in the distance. 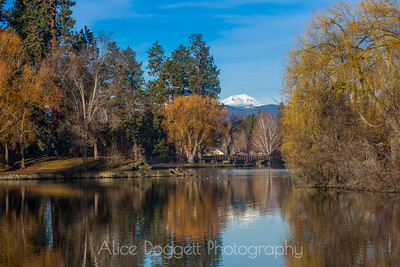 Mount Bachelor in the distance. 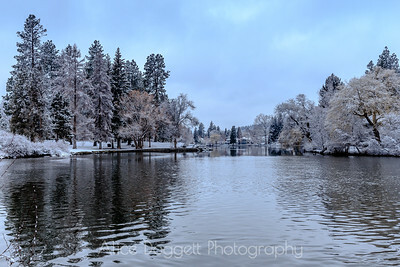 A light snowfall adds a wintry look to Drake Park and Mirror Pond. 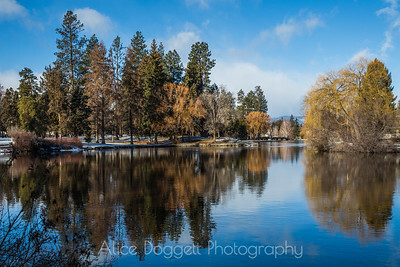 A snowy day in Bend gives a Christmas card look to Drake Park and Mirror Pond. 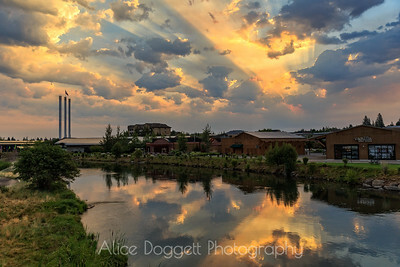 "Sit by a river. 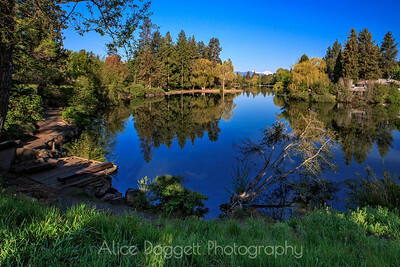 Find peace and meaning in the rhythm of the lifeblood of the Earth." 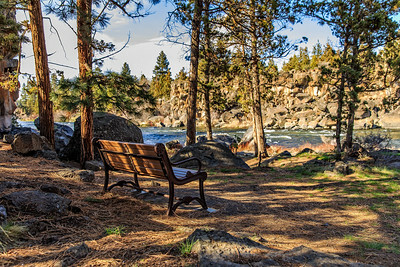 ~Author Unknown This bench certainly offers an invitation to hikers and walkers to take a break and enjoy the Deschutes River as it flows through Sawyer Park in downtown Bend, OR. 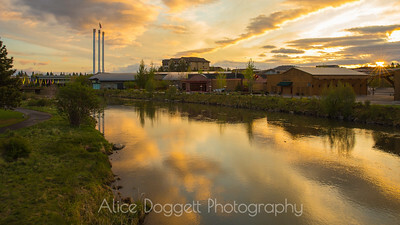 Late afternoon sun warmed the buildings in Bend's Old Mill District, and created nice reflections in the calm water of the Deschutes River. 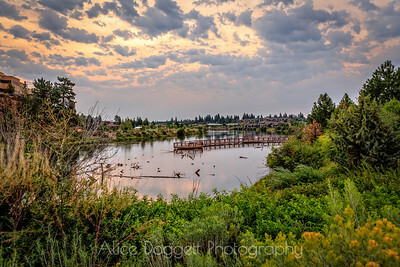 "Every sunrise is an invitation for us to arise and brighten someone's day." 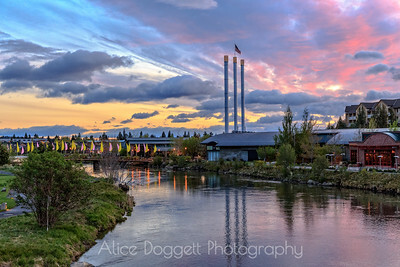 ~Richelle Goodrich This sunrise image at the Old Mill District in bend is from a pleasant early morning in May. 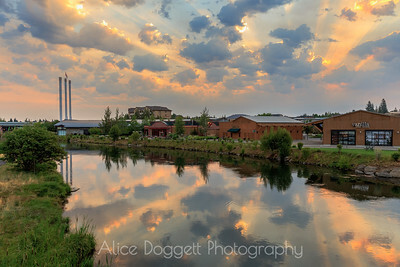 This sunrise in the Old Mill District was spectacular! 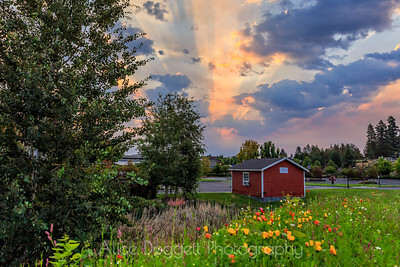 The rising sun broke through holes in the clouds and cast beams of light across the sky. 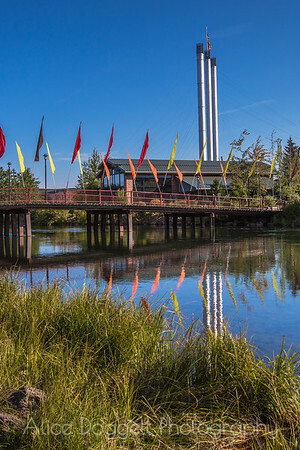 The DeWilde Stained Art Glass building is in the foreground. 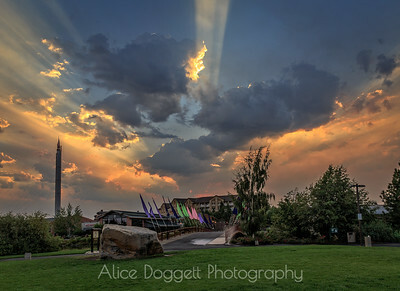 What could be better than a dramatic sky in a sunrise pic? 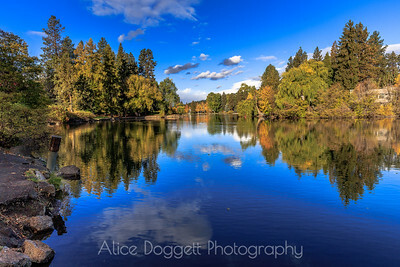 How about that same dramatic sky combined with a reflection in the glassy calm Deschutes River! 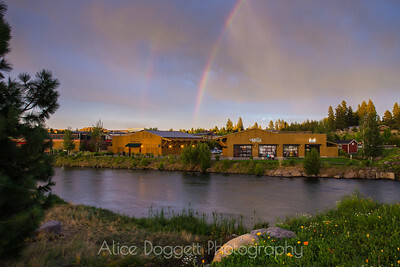 Evening thunderstorms caused a gorgeous sunset AND a double rainbow over the Old Mill District in Bend. 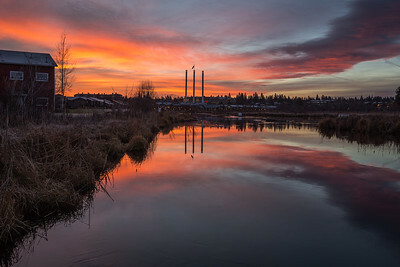 This December morning sunrise near Bend's Old Mill District filled the sky with color!